We’d love your help. Let us know what’s wrong with this preview of Never Stop — Finnish Science Fiction and Fantasy Stories by Anni Nupponen. 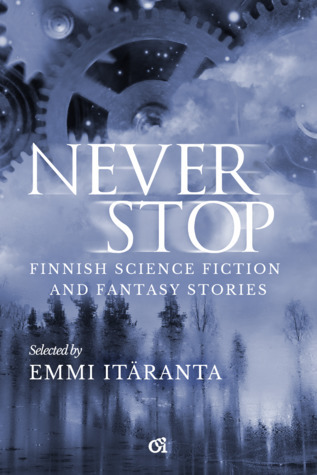 Never Stop — Finnish Science Fiction and Fantasy Stories is compiled by Emmi Itäranta and features gems in a wide range of genres, all published in English for the first time. "These stories invite you to see a glimpse of new lights emerging in the vast sky of international speculative fiction. You may not have expected them, but once they have caught your eye, you will hop Never Stop — Finnish Science Fiction and Fantasy Stories is compiled by Emmi Itäranta and features gems in a wide range of genres, all published in English for the first time. "These stories invite you to see a glimpse of new lights emerging in the vast sky of international speculative fiction. You may not have expected them, but once they have caught your eye, you will hopefully keep coming back for more." To ask other readers questions about Never Stop — Finnish Science Fiction and Fantasy Stories, please sign up. I was delighted to have been a small part of getting these stories out into the light of day - but while I was technically an editor / language checker for this anthology, my "job" really didn't feel like work. I just sat and read this great collection of stories. Every one of them drew me in almost from the first page, and every one of them gave me something new to think about, or wonder at, or wipe away a single glistening testosterone-laden manly tear. I can say it. These were great stories, t I was delighted to have been a small part of getting these stories out into the light of day - but while I was technically an editor / language checker for this anthology, my "job" really didn't feel like work. I just sat and read this great collection of stories. Every one of them drew me in almost from the first page, and every one of them gave me something new to think about, or wonder at, or wipe away a single glistening testosterone-laden manly tear. I can say it. These were great stories, the collection cleverly arranged and well-chosen to showcase some of the wonderful creative minds we have at work in the Finnish literary world. Do yourself a favour and get hold of this anthology. If you like short form speculative fiction at all, I'd recommend. I got this book at worldcon in Helsinki because I thought it was a shame to hear so much about Finish SFF and not actually read any (and it's surprisingly difficult to find any in translation) and I am extremely glad I did. The books aim according to the foreward is to give English language readers a glimpse at just how varied Finnish language SFF is, and it definitely succeeds at that. Everything from hard SF to fantasy is covered. While most wouldn't feel out of place in any English language co I got this book at worldcon in Helsinki because I thought it was a shame to hear so much about Finish SFF and not actually read any (and it's surprisingly difficult to find any in translation) and I am extremely glad I did. The books aim according to the foreward is to give English language readers a glimpse at just how varied Finnish language SFF is, and it definitely succeeds at that. Everything from hard SF to fantasy is covered. While most wouldn't feel out of place in any English language collection, others did seem like things that were distinctive (presumably distinctively Finnish, though as this is the only Finnish thing I've ever read I can't really comment on that). If anything the only thing that annoyed me about the book is that it was mainly just the collection of stories, I'd have loved an extended foreward or epilogue on why Finnish SFF is different from the rest of the genre, but that's probably expecting too much for a non profit publisher. Naturally for a collection of short stories how much I enjoyed them varied, some were not my thing, some I found completely amazing, but all were well written and thought provoking. There are one or two minor niggles where certain phrases feel slightly jarring (likely due to the translation) and a few typos but the quality of the stories is consistently high. Just what I needed, a sampler of Finnish sci-fi and fantasy stories. It's a mix of genres – some of them evolve from a historical background with their own twist, some resemble traditional folk tales, but I was pleased to find some science fiction among them too. Some motifs appear more than once – the sea seems to be a constant source of inspiration. The quality of the stories felt balanced, I don't have a clear favourite, but no dislikes either. Anni Nupponen is a Finnish writer who writes fantasy and science fiction. She writes about war, use of power and sadness, but also tells tales of love and kindness. She is inspired by fairy tales, steampunk and cyberpunk. She loves cats and sunshine. She lives in Tampere, Finland.